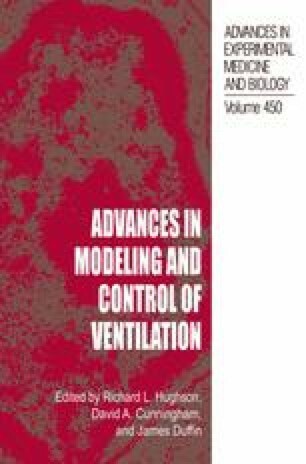 The ventilatory responses to dynamic leg exercise did not differ between voluntary and electrically induced exercise, and a significant correlation between pulmonary ventilation (V̇e) and carbon dioxide output (V̇co 2) was observed consistently during the two types of exercise (1). It was also reported that a close V̇e-V̇co 2relationship was maintained under the nonsteady-state conditions, i.e. during exercise with sinusoidal variations in limb movement frequency (3) and during recovery with and without limb movement from exercise (14). However, during incremental-load cycling exercise below the point of respiratory compensation, the slope of the V̇e-V̇co 2relationship at a pedaling rate of 60 rpm was steeper than that at 30 rpm (15). These results suggest that in addition to humoral stimuli, neural stimuli originating from the cortical and subcortical regions and/or from contracting muscles are involved in the control of exercise hyperpnea in the non-steady-state. It has been proposed that both the centrally-generated commands and the afferent signals from the contracting muscles to the respiratory control center are eliminated and/or reduced during stationary rest. In an earlier study (14), we examined the hypothesis that if both the central command and muscle mechanoreflex neural drives play an important role in ventilatory responses to exercise, these responses should be exaggerated out of proportion to metabolism through the associated CO2production during active recovery compared to during passive recovery. Consequently, we failed to ascertain the importance of the neural drives contributing to the ventilatory responses, since the tight coupling of V̇e-V̇co 2relationship was almost identical between the two recoveries.